Top Five Books, LLC, 9781938938344, 324pp. 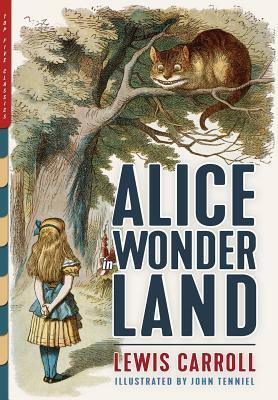 Originally written and hand-drawn from 1862 to 1864 by Lewis Carroll (Charles Dodgson) for 10-year-old Alice Liddell, the daughter of Dodgson's Oxford college dean, the manuscript "Alice's Adventures Under Ground" would become, with the help of John Tenniel's beautiful and humorous illustrations, Alice's Adventures in Wonderland, published by Macmillan in 1865 in Britain and the U.S. The book, at turns silly and satiric, gentle and wild, would quickly become beloved around the world by children and adults, and spawn the classic sequel Through the Looking-Glass (1871) and the immortal nonsense poem The Hunting of the Snark (1876). The author, a shy mathematics professor called Charles Dodgson, would become internationally famous and ever after remembered by his pen name, Lewis Carroll. The books have never gone out of print and over nearly two centuries have spawned countless offshoots and adaptations--books, artwork, plays, games, and movies. This Top Five Classics edition of the fully illustrated Alice books presents the stories the way they were meant to be enjoyed.